When trying to combat spaghetti syndrome, we tend to crack nuts with a sledgehammer. Carpets are cut open, office desks are drilled with holes, or cable ducts are laid at every possible angle and often only secured with double-sided adhesive pads. Failure is often pre-programmed from the very start. So what do professional installers use when they lay and route cables for customers? Well, definitely not rigid tubing, because plugs on the leads rarely fit through this. It is also fiddly and extremely time-consuming to use conventional spiral tubing if cables have to be routed over longer distances. HellermannTyton makes your desk cable management perfect with the cable organiser Helawrap. This cable management system is designed for domestic and office use. It puts an end to the cable chaos associated with PC’s, TV’s and Hi-Fi Systems. This raises the further question about how connecting cable from the bundle can be branched off at the desired position, or how more cable can be added without having to start all over again. For cable management challenges like these, there is a practical and efficient solution: Helawrap. 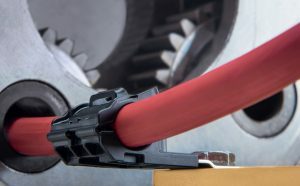 It is easy to combat the cable chaos in the office or at home using flexible Helawrap protective tubing and fixing components. Furthermore, organising cables with Helawrap is child’s play: simply pull the cover over the cable bundle using the blue applicator tool that comes with Helawrap and the individual cables leading from the PC, television or hi-fi system are bundled, protected and concealed. To see how easy that is, watch this video. The resulting cable harness can be mounted and fixed anywhere using Helawrap base and clip accessories. The Helawrap cable management system also excels through its adaptability in meeting individual demands. Due to the rounded openings, cable can be branched off and routed at any point along the tubing. This fast cable bundling tubing can of course be removed and reused as many times as you like, and cable can be added to the harness later on. Using the Helawrap HAT applicator tool, this is as easy as using a zip. Helawrap accessories are suitable for bundling and protection of multiple cable harnesses and wires. As an alternative to laying complicated cable ducts in the office environment or mounting spiral tubing that is difficult to wrap around the cable, the zip-lock type tubing also proves its flexibility for cable routing as well. The protective cable cover is available in convenient lengths of 2 meters with diameters of 16 mm and 22 mm. That makes it perfect for the chaos of leads and cables commonly found around the house. Furthermore, Helawrap is available in lengths of 25 meters and diameters of 9 mm, 16 mm, 21 mm and 32 mm for long cable bundles. These can be cut to length according to need. That should put an end even to the toughest Gordian cable knot. Since it is also important how it appears to the eye, Helawrap cable bundling protective tubing is available in white, grey, silver and black. Helawrap therefore not only bundles unattractive cable; you will hardly notice it. Organising cable in the office and at home for PCs, televisions, music systems etc. 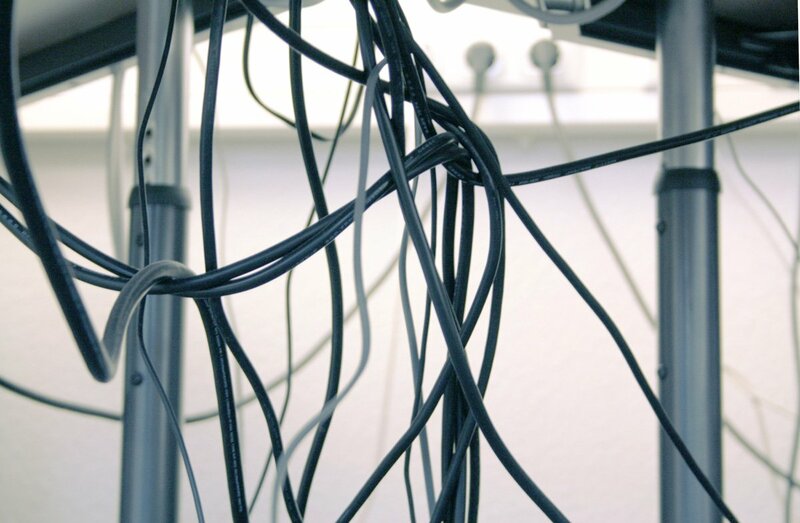 By the way, untidy tangles of cables lying around everywhere are not only an eyesore, they also compromise safety in the household and office. Loose leads often lead to tripping accidents. The keyword here is “safety”. Colourful leads are also an open invitation for household pets like rabbits to chew on, and can easily become treacherous in the hands of playing children. You will therefore find many good reasons for installing a flexible system of cable routing around desks, hi-fi systems and televisions. There is no better way to get rid of cable chaos than with the Helawrap protective tubing for cable bundling. Afterwards, to avoid mixing up cables that all look alike, we highly recommend using cable identification tags at the end of the cable to note the device it belongs to. For instance, keep an eye open for RiteOn®, the self-laminating label for manual cable marking. Video regarding RiteOn®. In contrast to all this cabling, the label dispenser can afterwards be returned to the desk drawer where scissors, staplers and the like belong. For further information on Helawrap, see the “Helawrap Cable Management System” brochure Helawrap, click here.